Really looking forward to speaking on a panel tomorrow night (Weds 15th Sept 2010) in North London 7.30pm, on the whole question whether the church as an organisation is a form of outdated technology. If interested check it out here. 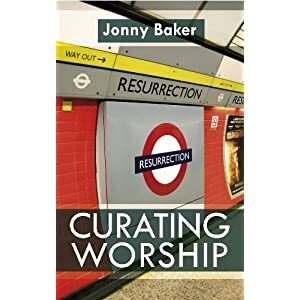 I have just been to a book launch of Jonny Baker’s new book – Curating Worship. This book is well overdue, and draws on the expertise of a number of practitioners of those who were involved in Alternative Worship, including Ana Draper, Sue Wallace, Steve Collins, Laura Drane, Nic Hughes and Kester Brewin, Pete Rollins and Jonny McEwen in the UK, Cheryl Lawrie from Australia, Dave White and Steve Taylor from New Zealand and others. Why is this book important? Well – for me, it is because quality in contextual and creative worship is important. Alternative or creative worship has become synonymous in some places as just putting up a white sheet or getting out the crayons and sometimes with very little content. What this book emphasises, is that this form of worship is a skill, and needs much thinking and engagement with theological thinking, engagement with metaphorical meaning, liturgy and ritual. When Curation is done well, its potential is world changing and can aid mission. When it is done badly (my contention) it just gets patronising and overly conceptual that may help some dechurched people get stuff off their chest, but doesn’t often enable wonder and encounter of the divine. We have experienced this in Moot, and so have stopped doing alternative worship for a bit, exploring more participative and contemplative forms of worship for a season. The work of groups like Grace, Vaux, L8r, Visions were important in my own Christian formation through a dechurched root. I have been holding onto the question whilst reading this book “Alt worship and curation are important for reaching and enabling dechurched people to request with Christian Spirituality – but what does curation of worship look like for those who are completely never churched, with no baggage or previous understandings?” This I think is the very real challenge of where we go next. How do we curate worship, in fact how do we curate church as a creative event of worship, mission and community in an increasingly post-secular culture where we can expect the numbers of the dechurched to reduce as ‘being churched’ increasingly becomes a minority sport. This book is a great start to exploring this question, and an important resource for all those who want to develop creative and artistic and cultural accessible forms of worship that is challenging and justice orientated. Well done Jonny et al, this is a great book. I have read it almost in one go as it held me that much!